Here we are going to see some example problems on solving word problems involving quadratic equations. To see from questions 1 to 3, please visit the page "Solving Word Problems Involving Quadratic Equations"
A girl is twice as old as her sister. Five years hence, the product of their ages (in years) will be 375. Find their present ages. Hence the age of sister is 10 years, age of girl = 2(10) = 20 years. 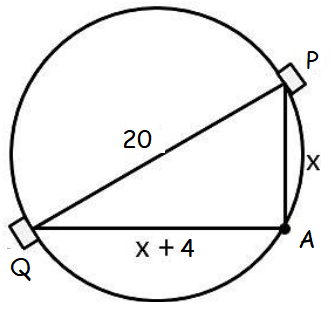 A pole has to be erected at a point on the boundary of a circular ground of diameter 20 m in such a way that the difference of its distances from two diametrically opposite fixed gates P and Q on the boundary is 4 m. Is it possible to do so? If answer is yes at what distance from the two gates should the pole be erected? x = -16 and x = 12. Hence required distance is 12 m and 16 m.
From a group of 2x2 black bees , square root of half of the group went to a tree. Again eight-ninth of the bees went to the same tree. The remaining two got caught up in a fragrant lotus. How many bees were there in total? Hence total number of bees = 72. After having gone through the stuff given above, we hope that the students would have understood, "Quadratics Word Problems with Answers". Apart from the stuff given in this section "Quadratics Word Problems with Answers", if you need any other stuff in math, please use our google custom search here.